Registration is required. Marriott Rewards, Starwood Preferred Guest, and The Ritz-Carlton Rewards (“Loyalty Program”) members who register for this promotion by January 7, 2019 will earn 2,000 bonus points per stay on stays of 2 or more nights at participating brands. Plus, members can earn an additional 1,000 bonus points per brand starting with the second brand at which the member stays during the promotion earning period. 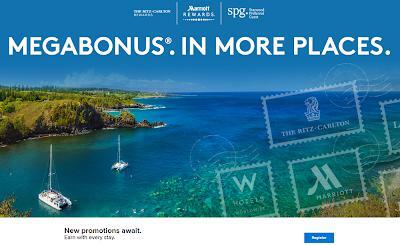 The promotion earning period is for stays between September 26, 2018 and January 31, 2019, at participating Marriott Rewards, SPG and Ritz-Carlton properties. A ‘stay’ is defined as consecutive nights spent at the same hotel, regardless of check-in/check-out activity. Rooms booked through most third party online retailers and select travel agency bookings are ineligible to earn for this promotion.The member receiving this offer has been targeted and the offer is not transferable. Bonus points will be awarded to the member’s account up to six weeks after the promotion ends. Marriott Vacation Club® owner-occupied weeks are not eligible for bonus points and nights spent while redeeming an award are not eligible for bonus points. Only one room per hotel is counted toward a member’s nights or stay. Members electing to earn miles are not eligible for this promotion. For a list of current participating brands, visit https:// www.marriott.com/loyalty/earn/hotels.mi. All Loyalty Program terms and conditions apply. See https://www.marriott.com/loyalty/terms/default.mi for more information. Visit www.Marriott.com /MorePlaces or call 888-MARRIOTT (888-627-7468) for complete details.Bonus points will be awarded to the member’s account up to six weeks after the promotion ends. Marriott Vacation Club® owner-occupied weeks are not eligible for bonus points and nights spent while redeeming an award are not eligible for bonus points. Only one room per hotel is counted toward a member’s nights or stay. Members electing to earn miles are not eligible for this promotion. For a list of current participating brands, visit https://www.marriott.com/loyalty/earn/hotels.mi. All Loyalty Program terms and conditions apply. See https://www.marriott.com/loyalty/terms/default.mi for more information. Visit www.Marriott.com/MorePlaces or call 888-MARRIOTT (888-627-7468) for complete details.Bonus points will be awarded to the member’s account up to six weeks after the promotion ends. Marriott Vacation Club® owner-occupied weeks are not eligible for bonus points and nights spent while redeeming an award are not eligible for bonus points. Only one room per hotel is counted toward a member’s nights or stay. Members electing to earn miles are not eligible for this promotion. For a list of current participating brands, visit https://www.marriott.com/loyalty/earn/hotels.mi. All Loyalty Program terms and conditions apply. See https://www.marriott.com/loyalty/terms/default.mi for more information. Visit www.Marriott.com/MorePlaces or call 888-MARRIOTT (888-627-7468) for complete details.Marriott Vacation Club® owner-occupied weeks are not eligible for bonus points and nights spent while redeeming an award are not eligible for bonus points. Only one room per hotel is counted toward a member’s nights or stay. Members electing to earn miles are not eligible for this promotion. For a list of current participating brands, visit https://www.marriott.com/loyalty/earn/hotels.mi. All Loyalty Program terms and conditions apply. See https://www.marriott.com/ loyalty/terms/default.mi for more information. Visit www.Marriott.com/MorePlaces or call 888-MARRIOTT (888-627-7468) for complete details.Marriott Vacation Club® owner-occupied weeks are not eligible for bonus points and nights spent while redeeming an award are not eligible for bonus points. Only one room per hotel is counted toward a member’s nights or stay. Members electing to earn miles are not eligible for this promotion. For a list of current participating brands, visit https://www.marriott.com/loyalty/earn/hotels.mi. All Loyalty Program terms and conditions apply. See https://www.marriott.com/ loyalty/terms/default.mi for more information. Visit www.Marriott.com/MorePlaces or call 888-MARRIOTT (888-627-7468) for complete details.For a list of current participating brands, visit https://www.marriott.com/loyalty/earn/hotels.mi. All Loyalty Program terms and conditions apply. See https://www.marriott.com/loyalty/terms/ default.mi for more information. Visit www.Marriott.com/MorePlaces or call 888-MARRIOTT (888-627-7468) for complete details.For a list of current participating brands, visit https://www.marriott.com/loyalty/earn/hotels.mi. All Loyalty Program terms and conditions apply. See https://www.marriott.com/loyalty/terms/ default.mi for more information. Visit www.Marriott.com/MorePlaces or call 888-MARRIOTT (888-627-7468) for complete details. **NO PURCHASE NECESSARY. Void where prohibited. Open to legal residents of the 50 US/DC/PR, AR (excluding MZ, NQ, RN, SA, & TF), CA, CL, CN, CR, DE, DO, FR, HK, IN, JP, KP, MX, NL, PE, UK, ZA who are Marriott Rewards, Starwood Preferred Guest or The Ritz-Carlton Rewards members with a completed member profile and at least 18 years old or age of majority, as of date of entry. Void in all countries/regions not listed. Begins 10:00 am ET on 10/4/18; ends 11:59 pm ET on 11/1/18. Odds of winning a Grand Prize are dependent on number of eligible entries received. One (1) Grand Prize of twenty-nine (29) 2-night stays at each of the 29 brands of $30,596.80USD maximum value (odds 1: 4,500,000); Eighty-seven (87) 4-night stays of $3,060USD maximum value each (odds 1:52,000); Two million, four hundred and twenty-one thousand and five hundred (2,421,500) Point Wins of $180USD maximum value each (odds 1:2). For complete Official Rules, prize values and eligibility, visit www.Marriott.com/29Ways. Sponsor: Marriott International, Inc.